The Cryogenic SMS series intelligent magnet power supplies have been developed over many years to meet the needs of magnet operators. The power supplies are designed and made in house to suit varying system specifications. 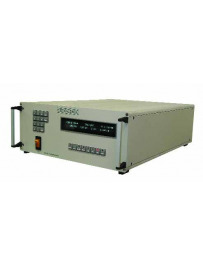 Our standard range of power supplies are suitable for most laboratory systems, however, for special applications such as fast ramp magnets we can provide high voltage high power units to meet more exacting requirements. The power supplies have manual control via the front panel and remote control via a USB interface (other interfaces are available on special request). This allows the power supply to be linked to run under software control and provides safe magnet operation. We use LabVIEW® software which is installed in the main system computer to drive the power supplies and other parts of the cryogenic system. Standard output ranges are from 10 to 600 Amps. Cryogenic offers Magnet Power Supplies with an integral 4 Quadrant unit allowing the field to be swept linearly through zero without using relays for current reverse. This state-of-the-art unit gives true display of both current and voltage on the front panel. For customers who require a higher resolution, for example NMR or MRI measurements, Cryogenic offers 20bit current setting using an onboard 20-bit DAC and high-stability current transducer to give typical stability of 3 ppm/K. To provide a continuously sweeping vector field in three dimensions we offer a set of three superconducting magnet power supplies, driven from a single driver card in a computer, enabling the magnetic field vector to be swept through an arbitrary path in all directions. The three power supplies are each driven by an analogue voltage input, with precise current transducer monitoring of the current to the magnet. The system provides 16 bit current setting resolution plus sign on each axis. Operated under computer control, the virtual instrument displays the output current, magnetic field vector, voltage across the output terminals and status (i.e. magnet quench and status of the superconducting switch if fitted. There is also a graphical display of the field vector. The low field option allows users to work with very low fields. As an example for a magnet with 1000 Gauss/Amp the power supply will allow precision field control of +/-30 mT with a resolution of 1 µT. This is achieved by adding a precision 4-quadrant low current source of 300mA to the main power supply. If the magnet has previously been to high field, then the remanent field can be removed through heating the magnet or by going through a degaussing procedure. For the cryogen free magnet, heating is particularly easy. Using the degaussing procedure, a zero field to within 0.1 mT can be achieved.